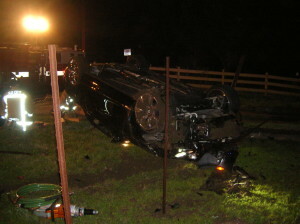 A 34-year-old Arroyo Grande woman and a 22-year-old San Luis Obispo man had to be extracted from a 2009 Bentley after a crash at 1:25 a.m. on Friday. Police found Jamie Bartlett and her unnamed passenger trapped in the overturned car near the intersection of Orcutt Road and Johnson Avenue. After firefighters freed them from the car, Emergency medical personnel transported Bartlett and her passenger to Sierra Vista Regional Medical Center where they were treated for minor to moderate injuries. After Bartlett’s release from the hospital, officers booked her into the San Luis Obispo County Jail for felony driving under the influence. Her bail was set at $100,000. Are we going to let this person go with a small fine or a warning? Maybe next time she will hit someone and destroy their life or the lives of others? At a minimum, she should lose her license for some time and 6 months of community service. Perfect, Roger! Take away her license. Then she’ll be driving drunk without a license or insurance. How does that make things better??? What a waste of a $300,000. car. Money still can’t buy sense. Money can’t fix stupid either! The surprising part is that an AG woman was driving a Bentley. A Cougar would have been more appropriate. Cougar? I think you mean gold digger. If she’s driving a Bentley, she’s clearly went for the older richer demographic. Her 22 year old passenger is probably her boyfriend on the side.